Today I've been asked to preserve a memory. 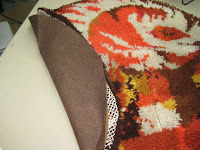 The client has a rug hooked by a relative who has since passed away. She would like to clean it and have it backed. I bought a yard of jute and began by cutting it to the same size as the rug. Next, I turned under about ¾" of the jute, so the edge became even with the rug bottom. Jute stretches a bit, so I had enough to make the folded edge even with the rug edge. I pinned all the way around. 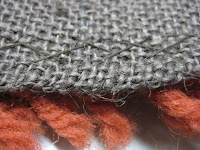 Using a simple catch stitch, I rotated around the rug to attach the jute to the back of the rug. 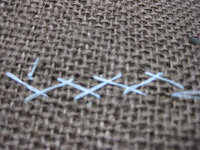 Here is a close up, sewn in contrasting blue thread. It took about 2 hours to sew all the way around the rug. The fabric of the rug is stiff and hard to work with. And here, the real thing. 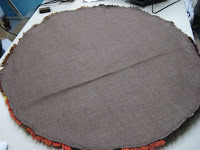 The rug now has a finished look to it and the raw edges are encased in the jute. Doing alterations with any speed requires the use of some good tools. They don't necessarily have to be expensive, nor do they have to be found in the fabric store. Here is a common knife blade that you will find at your local hardware or craft store. They come in different sizes and vary in cost. I think this one was a dollar! 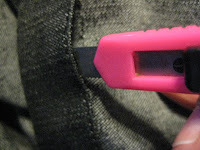 Although you can't see the tip, here, it is basically a razor blade with a safety handle. The tip is cut at an angle. This one also has sections that can be snapped off, as the tip becomes dull. Look closely at the diagonal lines in the blade in picture one. 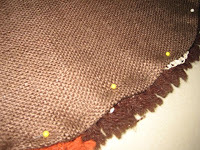 I use this to remove hem stitching, as shown. 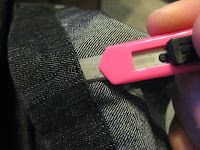 I also use it for removing zippers. 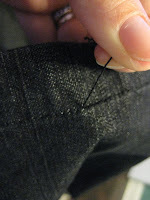 It makes ripping a long line of stitching easier and faster, as long as you are careful not to nick the fabric. 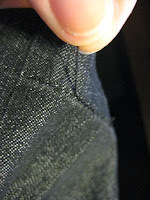 It helps to hold the garment taut, so that the blade glides easily as it cuts the stitching. This will also help you keep from accidentally cutting into the fabric. Of course you will still have to pick out all those cut stitches after you are through. I don't really have a tool that makes that task go any faster! Start the Year with a Sense of Humor! As you look back on 2009, remember to look at the bright side of things and carry that attitude through to this year. Keep your sense of humor, even when you're doing something you dislike. When I work at my dry cleaners, I am often asked to unravel the twisted insides of a tie. They all know I hate this tedious job. We marvel as to how ties could get so messed up on the inside. Does the wearer not untie it before removing? Does it ride around in someone's car for 6 months? Do you give it to the baby to play with?